That is a really cool sound. Gotta love a vette with an open exhaust. Obviously to appeal to a certain crowd but they sound so quite stock, open those vettes up grandpas! Huh? I currently own GM & Ford and have driven various other vehicles. I even said in a previous post that if you want the best sound, there are other options. I don't have brand loyalty. You are looking for something that isn't there. Last edited by VIP1; 4/28/15 at 08:19 PM. Nope, not looking for anything at all. Your note seemed to insinuate that I was brand loyal to GM and he was loyal to Ford. I can't speak about him but I know I've had lot's of different makes as well, including the ones in question here. It's all good. For what it's worth another sweet sounding engine is the Wright R-2600. I need to open my Coyote up but as far as sound goes I love a fox car with an off-road H and flows next up would be the SN95/New Edge cars in the same configuration. In both the fox and the later SN95/New Edge the muffler placement was perfect. The S-197 cars though require something different. I've never liked the sound of an S-197 with an H-pipe and chambered mufflers. They sound much better with an X pipe and a more traditional muffler or straight through perforated core with the placement of the muffler in the rear. The same with the S550, its rear muffler placement also favors and X pipe and traditional or straight through muffler over an H and chambered muffler. My favorite for the new car right now is the Corsa Extreme with double X.
I get crazy compliments on how good my 14 GT with Gt500 axle backs sound lol. I don't understand why some people say they don't like the Coyote sound. Personally I think above 5K rpm the DOHC V8's sound way better because they absolutely f%^king screeeeem hahaha!!! The best sounding V8 is and always will be a HEMI! Bingo. What I currently have, hence my earlier statement above... folks who don't think the Coyote sounds good, haven't heard a Corsa Extreme setup, paired with x pipe, intake, and blower. With so many different possible configurations in exhaust, intakes, manifolds, headers, this is pretty goal less topic, unless we compare engine sound from all stock cars, theres too many variables to determine what sounds the best. personally for all stock sounding car, Hellcat is my favorite, the supercharger scream is so perfect, if I was to supercharge would make sure it would have to sound very similar to the hellcats whine. Yup, among its other varients, the Camaro SS1LE is a force to to be reconned with. In other words, any Mustang owner that dares tangle with it -stock to stock- is gunna leave the fight with a frown. Ford needs to get its poop in a pile and figure out how to make a car really perform straight out of the gate without the need for us to have to add a pile of aftermarket parts and cash to the cars they're selling us just so we can stay close. Just my opinion of course, yours may vary with mileage and taste! 390 ci engine, high compression motor, high lift cam, long tube headers and cherry bomb mufflers. Music to my ears. Too bad I totaled my beast in a drag race at 16. Haven't found one like her yet. My first car, but not my last Stang - getting a 2017 soon ! 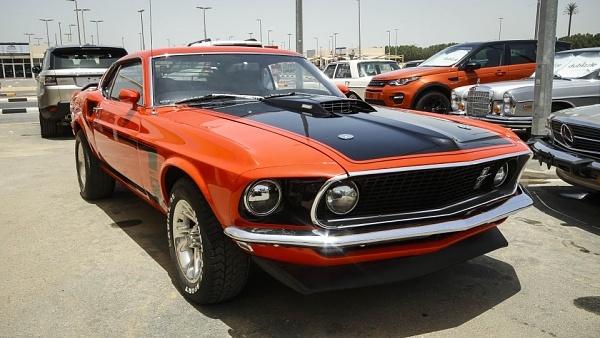 My 1969 Ford Mustang Mach 1 looked just like this one. Last edited by GTRacerX. ; 1/13/17 at 05:08 PM. This thread is music to my ears. There is no best sounding IMO. They all sound so awesome. I guarantee whip lash just for hearing any one of these go down the street. Last edited by Rick Gonzalez; 4/16/17 at 04:18 AM. I have more than once driven by a 5.0 and sure enough couldn.t hear any exaust to comment on.I do know my 16 5.0 coyyote with 409 flomasters sounds very nice.